Freedom. It's a word I hear frequently as an Air Force veteran. While I was on active duty, the sound of fighter jets roaring overhead was always referred to as "the sound of freedom." People thank me often for my military service, believing that I played at least some small part in maintaining the freedom of our nation. But as a single mother currently living with multiple sclerosis (MS), the word freedom has a very different meaning. For example, thanks to my BraunAbility MXV built on the Ford Explorer, I now have the freedom to take my children on an exciting family road trip across four states—but we'll get to that in a bit. I was on active duty serving as a captain and Special Agent in the Air Force in 2005 when I was diagnosed with MS, an autoimmune disease that affects the central nervous system. I had recently gotten married and expected to continue my military career for at least several more years. The diagnosis meant a medical retirement after more than eight years of service, and it threw my life and thriving career into a tailspin. I was lucky to be able to move into the field of intelligence analysis as a civilian and specialize in Mexico's drug war and border security less than a year later. However, my MS eventually started progressing and began affecting my ability to walk. Fortunately, my professional success was moving more quickly than my disease. My husband (who is also in the Air Force) had to move to another base, so we moved from northern California to Illinois and I had to quit my analyst job. I taught myself how to work as a freelance writer and started a consulting business. Over the next few years, I would raise two amazing little boys, write (and publish) two books, go through another military move to Arizona, and appear on virtually every major national news outlet as a drug war expert. But then 2015 hit, and it was one of the hardest years of my life. I got divorced, no longer had my children with me every day (their dad and I agreed they would live with him during the school year), and moved from Arizona to Florida to be near my family for support. I was using a power wheelchair almost full-time for mobility, and living by myself for the first time in 10 years. It was also getting very difficult, and sometimes downright dangerous, to walk the few steps to the trunk of my crossover vehicle to load and unload my travel scooter. One month at a time, I got more settled into my new life. Things started to coalesce and I was able to (figuratively) get back on my feet. I got back to work. I started a nonprofit called The PreJax Foundation, which provides college scholarships to exceptional students who have either MS or a parent with MS. I rekindled my lifelong passion for solo travel and went on an international trip with my scooter for the first time. And I became a pageant winner. I learned about the Ms. Wheelchair USA competition while searching for ways to promote my foundation. While I love to get dressed up and get my hair and makeup done, I'm not really into frilly and "girlie" things; essentially, I never really played princess as a child. I was skeptical about applying for a spot in the pageant, but I really loved how the evaluations and judging focused less on physical appearance and more on character, accomplishments, and community involvement. I was awarded the regional title of Ms. Wheelchair Southern USA in March 2016, then competed for and won the national title of Ms. Wheelchair USA in July 2016 in Ohio. As a former military officer and federal agent, I never thought competing in a pageant could be such a life-changing experience. In fact, because of my professional history and my physical likeness to Sandra Bullock, I got called "Miss Congeniality" a lot! But pageant week was the first time in my life I had met other wheelchair users. These were beautiful, accomplished, driven women who shone from within in such unique ways. As I write this, I'm preparing to drive up to Ohio to meet this year's group of contestants and pass on my title to the next Ms. Wheelchair USA on July 29. It's a long drive from Florida to Ohio, but I was lucky to be able to make that first trip to the pageant shortly after getting my Ford Explorer MXV in May 2016 through a vehicle grant from the Veterans Administration (VA). It could not have happened at a better time, as it was becoming almost impossible for me to go anywhere without help to load and unload my scooter. 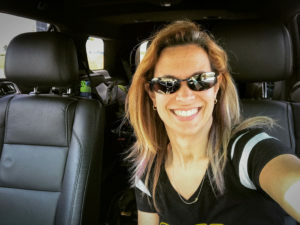 When I started going through the process with the VA to get evaluated for the vehicle grant, I thought I would get stuck with a huge minivan—what I felt was a waste of space for mostly one person. Admittedly, I am a bit vain when it comes to cars; I had spent eight years with two children and had successfully avoided having to buy the "soccer mom van," and I didn't want to succumb now. But then something glorious happened at the VA facility in Tampa, Florida. The vehicle grant evaluator in prosthetics showed me a brochure for the BraunAbility MXV! I couldn't believe such a cool, accessible Ford Explorer could exist, and with BraunAbility modifications just like a van. The interior space was smaller than that of an accessible van, but fortunately, both my power wheelchair and electric scooter are small enough to fit comfortably. I loved how the back seats easily fit my two boys, and how luxurious the driver's transfer seat was for me. These last two features were especially valuable during a recent family road trip to North Carolina with my mom and the boys. We first drove from the Orlando area to Raleigh, NC, to stay with my best friend and her family. 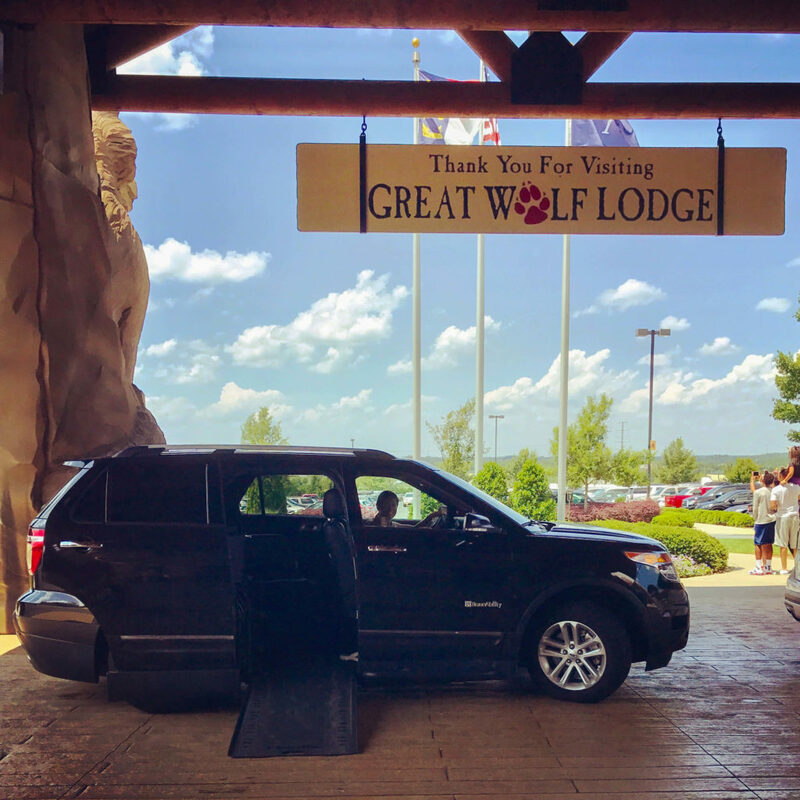 Then came the really exciting part—an overnight stay at the Great Wolf Lodge and indoor water park outside of Charlotte! Their commitment to accessibility is commendable, as I was able to use a water wheelchair to go into the wave pool and get buckets of water dumped on my head, as well as use a pool lift to float next to my sweet boys. We didn't want to leave North Carolina and it was a long drive home, but it was made so much easier by the comfort of my MXV. I even got compliments on my vehicle from an unmodified Explorer owner who was parked in front of me at the Lodge! As a single mom driving with two kids, I appreciate every square inch of my MXV: the multiple cup holders for water bottles and fast food drinks, charging ports for DVD players and tablets, and a rear A/C panel they can control. Even with the third-row seats in use, I had enough room for three suitcases, my portable ramp, and plenty of toys! However, the most valuable thing about my MXV is the freedom to simply travel with my children. To visit my family in the next town. To go out with my friends and attend events on weekends. To lead the active lifestyle that I want to lead with no limitations. And I'm just getting warmed up. I started an accessible travel blog called Spin the Globe this past December through which I document all my travels—including the 17 countries I'll visit this year alone. I'm planning out road trips with either my MXV or other BraunAbility modified vehicles to places such as New England, the Badlands in South Dakota, and the Canadian Rockies. And I'm opening my own accessible travel agency to help other wheelchair users like me explore this amazing world. So, stay tuned; there will be more adventure to come!